What do we glass fanatics do when it’s 5 degrees or 18, and snowing out? We break glass. 🙂 We just took pictures of a large black bear panel and are starting on a beautiful butterfly window. What projects are you working on? We’d love to see your project pictures! 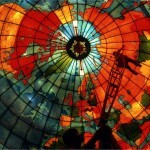 THE STAINED GLASS MAPPARIUM – Amazing!